Equine feed balancers are designed to complement a horse's normal feed ration. Horse Feed Balancers contain protein which a provide a horse or pony with the essential amino acids needed for muscle and tissue. A feed balancer also contains anti oxidants which help to remove toxins from the horse's body and ingredients which promote healthy hoof growth such as biotin, calcium and methionine. 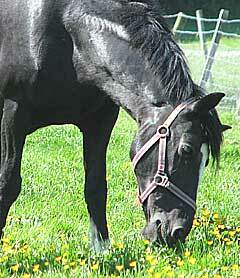 WHEN SHOULD YOU FEED AN EQUINE FEED BALANCER? A feed balancer is good a for a horse or pony who is not being fed the recomended volume of concentrates for the work that it is doing - for example an excitable competition horse may need his concentrates such as oats cut down to keep him under control. Feed a low energy concentrate is more suitable for these horses and as a result, they may not receive adequate vitamins and minerals in their diet - which could cause long and short term problems with the health of your horse. An equine feed balancer will help to provide a balanced diet by increasing the amount of vitamins and minerals in the horse's feed. They are also ideal for horses are not working hard and that "do well" on low levels of hard feed or mixes. They may be lacking in some nutrients in their diets and a feed balancer will do as the name suggests - make sure that the horse receives a good balanced diet. Most horse feed concentrates don't contain probiotics or yeast cultures. If you add a feed balancer to a horse or pony's diet, you will be providing these probiotics which aid digestion and absorbtion of nutrients. Feed balancers can also be is good for horses where a horse is grazing on poor quality pasture or being fed low quality hay. Equine Feed balancers should be gradually introduced to the horse's diet - taking 3 - 4 days to reach the final amount. The best way to feed is to split the total amount of feed balancer between each of the horse or pony's daily feeds. Be careful not to over supplement and upset the balance of your horse's diet by feeding too many supplements. Generally it is best to choose one supplement or balancer and not combine too many different products.